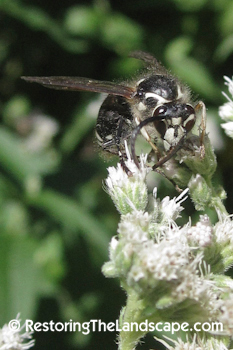 Wasps get a bad rap because of their stinging capabilities. But many gardeners know that they can be a welcome addition to the landscape, pollinating flowers and parasitizing other insects to keep populations in check. I have never been stung by a wasp or bee while working in the garden. Most often people get stung when they unknowingly come across or disturb a nest. After reviewing photos from this past growing season, I realized I captured a lot of new wasp visitors in our landscape. This year, I plan to spend more time observing their behavior to find more clues about their roles in the ecosystem. I saw two types of Ichneumon Wasps in our yard. Both have the same common name - Giant Ichneumon. The first is Megarhyssa macrurus (photographed a few years ago) and pictured below. 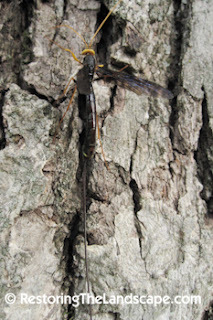 The second Giant Ichneumon ~ Megarhyssa atrata was about the same size but can be up to 3 inches in length. It has an all black body and with a yellow head and legs. The female's ovipositor can be 4 inches in length. We saw several of these walking in the woods at a local park this summer. Their flight is slow with the ovipositor hanging downwards. I photographed this particular one in our back yard on a white oak tree in late May. These large black wasps were found pollinating Dotted Mint (Monarda punctata) in the early summer and Culver's Root (Veronicastrum virginicum), Rattlesnake Master (Eryngium yuccifolium), and Milkweeds (Asclepis species) in mid to late summer. 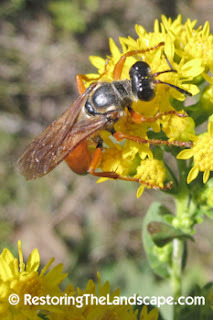 This colorful wasp has bright orange legs and body. 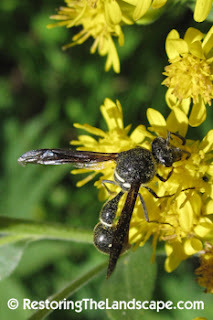 I saw this wasp for the first time in our yard in early September nectaring on Stiff Goldenrod. 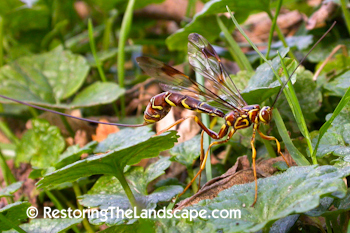 Read a post about these wasps and check out a video link of the Golden Digger carrying off prey to their nest at the Bug Eric blog. 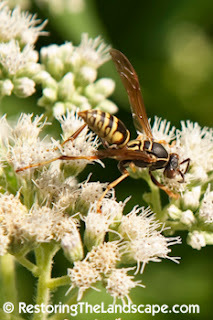 We saw Northern Paper Wasps from mid July through late September. 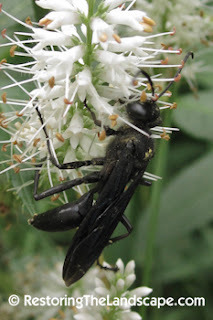 Pictured here on White Snakeroot (Eupatorium rugosum). Our cedar picket fence is a popular spot for both the Aerial Yellowjacket and Baldfaced Hornet. You can hear these wasps chewing the wood fibers several feet away as they move vertically up the pickets collecting the wood pulp for their nests. We also saw these wasps nectaring on Milkweeds. Baldfaced Hornets are black with white markings. They are larger than the Aerial Yellowjackets about 3/4 inch in length. They nectared in our yard in August on Eupatoriums. They build the large paper nests that hang high up in tree branches and hunt other insects. 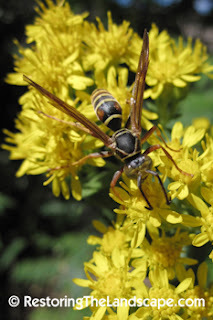 We saw these wasps in late August and September on several species of Goldenrods. 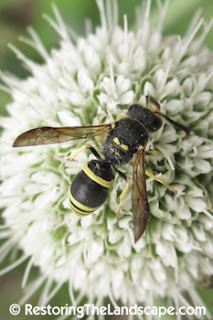 This Mason Wasp was found on our Rattlesnake Master (Eryngium yuccifolium) from mid July to mid August. 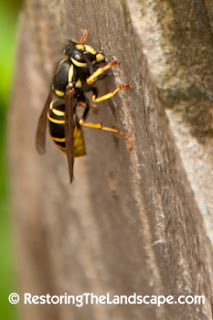 What kind of Wasps do you see in your landscape?